At the risk of putting too fine a point on it, Hackaday exists because people are out there building and documenting open source gadgets. If the person who built a particular gizmo is willing to show the world how they did it, consider us interested. Since you’re reading this, we’ll assume you are as well. Over the years, this mentality has been spreading out from the relatively niche hacker community into the greater engineering world, and we couldn’t be happier. Case in point, the Poseidon project created at the California Institute of Technology. Developed by students [Sina Booeshaghi], [Eduardo Beltrame], and [Dylan Bannon], along with researcher [Jase Gehring] and professor [Lior Pachter], Poseidon consists of an open source digital microscope and syringe pump which can be used for microfluidics experiments. The system is not only much cheaper than commercial offerings, but is free from the draconian modification and usage restrictions that such hardware often comes with. Of course, one could argue that major labs have sufficient funding to purchase this kind of gear without having to take the DIY route. That’s true enough, but what benefit is there to limiting such equipment to only the established institutions? As in any other field, making the tools available to a wider array of individuals (from professionals to hobbyists alike) can only serve to accelerate progress and move the state of the art forward. 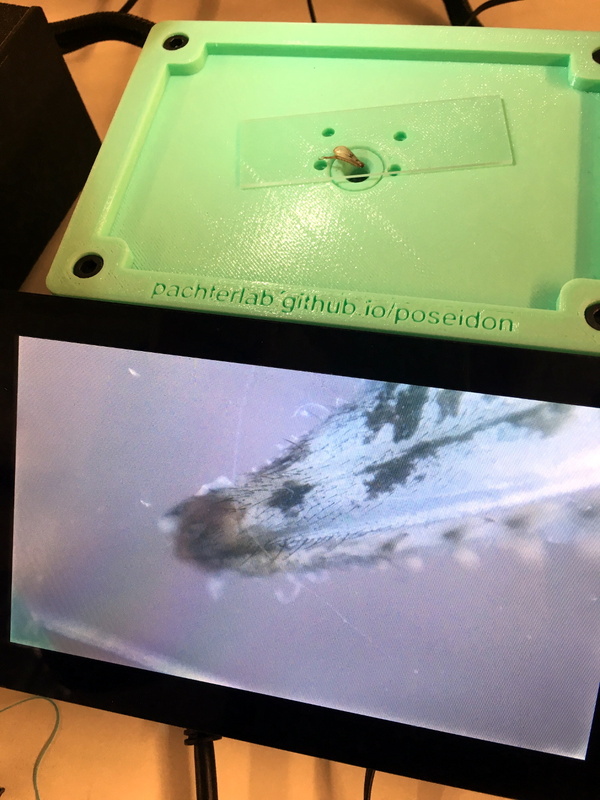 The Poseidon microscope consists of a Raspberry Pi, touch screen module, and commercially available digital microscope housed in a 3D printed stage. This device offers a large and clear view of the object under the microscope, and by itself makes an excellent educational tool. But when running the provided Python software, it doubles as a controller for the syringe pumps which make up the other half of the Poseidon system. Almost entirely 3D printed, the pumps use commonly available components such as NEMA 17 stepper motors, linear bearings, and threaded rods to move the plunger on a syringe held in the integrated clamp. Controlled by an Arduino and CNC shield, these pumps are able to deliver extremely precise amounts of liquid which is critical for operations such as Single-cell RNA sequencing. All told a three pump system can be built for less than $400 USD, compared to the tens of thousands one might pay for commercially available alternatives. The Poseidon project joins a relatively small, but very exciting, list of DIY biology projects that we’ve seen over the years. From the impressive open source CO2 incubator we saw a few years ago to the quick and dirty device for performing polymerase chain reaction experiments, there’s little doubt about it: biohacking is slowly becoming a reality. Most of our 3D printers print in plastic. While metal printing exists, the setup for it is expensive and the less expensive it is, the less impressive the results are. But there are other materials available, including ceramic. You don’t see many hobby-level ceramic printers, but a company, StoneFlower, aims to change all that with a print head that fits a normal 3D printer and extrudes clay. You can see a video of the device, below. They say with some modifications, it can print other things, including solder paste. The concept isn’t new. There are printers that can do this on the market. However, they still aren’t a common item. Partially, this is a cost issue as many of these printers are pricey. They also often require compressed air to move the viscous clay through tubes. StoneFlower has a syringe pump that doesn’t use compressed air. [Mohamed Sami] built a syringe pump out of Meccano building set parts. It consists of a simple framework with a DC motor mounted on it that actuates the syringe when powered. A check valve harvested from an ordinary household spray bottle keeps the syringe from sucking back liquid that it has just pumped out, so it can keep pumping forever. A lead-acid battery powers the whole thing. Syringe pumps are typically used to deliver precisely measured quantities of substances. Right now [Mohamed]’s rig is just an uncontrolled pump, but he hopes to get a better understanding of and control over how much liquid gets pumped. Adding an encoder to the DC motor would be a start, was his thought — or even better would be a stepper. You’d be surprised how many syringe pump projects we publish. Not just another syringe pump, but simple hydraulic projects and even using the syringe barrel as a logic probe’s enclosure. If you had a choice between going to your boss and asking for funds for a new piece of gear, would you rather ask for $3000 to buy off-the-shelf, or $200 for the parts to build the same thing yourself? Any self-respecting hacker knows the answer, and when presented with an opportunity to equip his lab with a new DIY syringe pump for $200, [Dr. D-Flo] rose to the challenge. The first stop for [Dr. D-Flo] was, naturally, Hackaday.io, which is where he found [Naroom]’s syringe pump project. It was a good match for his budget and his specs, but he needed to modify some of the 3D printed parts a little to fit the larger syringes he intended to use. The base is aluminum extrusion, the drive train is a stepper motor spinning threaded rod and a captive nut in the plunger holders, and an Arduino and motor shield control everything. The drive train will obviously suffer from a fair amount of backlash, but this pump isn’t meant for precise dispensing so it shouldn’t matter. We’d worry a little more about the robustness of the printed parts over time and their compatibility with common lab solvents, but overall this was a great build that [Dr. D-Flo] intends to use in a 3D food printer. We look forward to seeing that one. It’s getting so that that you can build almost anything for the lab these days, from peristaltic pumps to centrifuges. It has to be hard to concentrate on your science when there’s so much gear to make. Syringe pumps are valuable tools when specific amounts of fluid must be dispensed at certain rates and volumes. They are used in many ways, for administering IV medications to liquid chromatography (LC/HPLC). Unfortunately, a commercial pump can cost a pretty penny. Not particularly thrilled with the hefty price tag, [Aldric Negrier] rolled up his sleeves and made a 3D-printed version for 300 USD. [Aldric] has been featured on Hackaday before, so we knew his latest project would not disappoint. His 3D Printed Syringe Pump Rack contains five individual pumps that can operate independently of each other. Five pieces are 3D-printed to form the housing for each pump. In addition, each pump is composed of a Teflon-coated lead screw, an Arduino Nano V3, a Pololu Micro stepper motor driver, and a NEMA-17 stepper motor. The 3D Printed Syringe Pump Rack runs on a 12V power supply using a maximum of 2 amps per motor. While the standard Arduino IDE contains the Stepper library, [Aldric] wanted a library that allowed for more precise control and went with the Accelstepper library. The 3D Printed Syringe Pump Rack has a measured accuracy of 0.5µl in a 10ml syringe, which is nothing to laugh at. Syringe pump racks like [Aldric’s] are another great example of using open source resources and the spirit of DIY to make typically expensive technologies more affordable to the smaller lab bench. If you are interested in other open source syringe pump designs, you can check out this entry for the 2014 Hackaday Prize.